One year after I took down iGreekNews (along with iMe), I decided to re-implement iGreekNews using a new approach. It was time to put my NodeJS skills to good use, and construct an API around news feeds, and RSS, and also re-write the iOS application from the ground up using Swift. 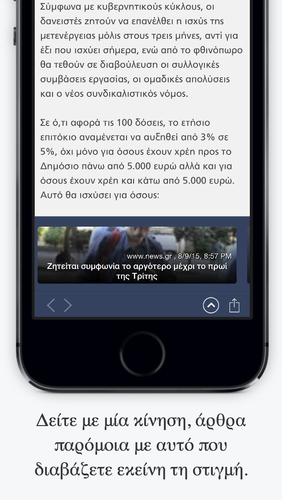 The result, after a few months of working in my free time, is iGreekNews v 2.0, which was released today as an update of the old application, in the App Store. Creating It turned out to be more interesting than I originally anticipated. It allowed me to approach scalability and performance from two opposite ends of development (server – client). The new Oramind Platform (on top of which iGreekNews is constructed) is able to find keywords from the content of articles, and associate articles using these keywords. What is the Oramind Platform? The Oramind Platform is a research project of mine, designed to collect, categorise and provide data to developers (me, and 3rd parties). At its initial stages, it works with pre-defined URLs news sources, such as Greek RSS feeds, and Twitter. Having been build from the ground up to be mobile friendly, is provides a concrete mobile API, and some streaming endpoints. I have already began giving the endpoints to other developers (as a very closed beta) for constructing more applications on other platforms. It’s still in its infant stages, and it will undergo major changes in the coming future. An iPad version will soon follow. 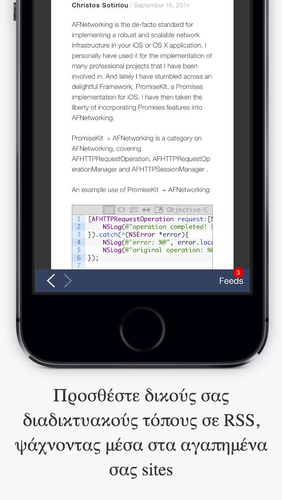 Swift gave me a lot of headaches in the process of creating it, but it was definitely worth it. You can download the application for FREE, here!